3 Dimensional Physical Therapy | I Can’t Eat Whatever I Want? 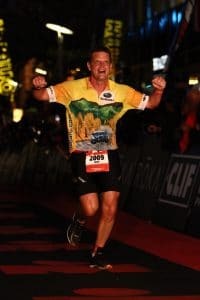 I have spent much of the past 15 years training for and competing in endurance races such as marathons and Ironman triathlons. One of the perks of doing this was that I was pretty much able to eat as much food as I wanted. I love food – this was one of my main motivations for doing these races in the first place. It meant I really didn’t have to worry too much about gaining weight. If I put on a few pounds I could quickly make them go away by training for another race. I have weighed pretty much the same since I was 18 years old (plus or minus a few pounds). After I finished my last Ironman race in October 2017 though this started to change. I remember driving home from the race in Louisville and stopping at a Pirmanti Brothers Restaurant and ordering a sandwich with kielbasa, perogies, roast beef, fried eggs and cheese, in addition to the fries they pile on top (best sandwich I ever ate!). I could still eat whatever I wanted with no repercussions, right? Over the next year however, I slowly put on weight because of my eating habits. To complicate matters, I had to get my left hip replaced in August 2018 because of all these crazy races I had done (click here for that story). My activity level drastically diminished and I knew I needed to do something to stop gaining weight. In November 2018, I got in touch with dietitian, Lynne Nugent from Know It All Nutrition and asked for her help. When I stepped on the scale at our first session it was an eye opener – I was 20 pounds heavier than what I weighed a year earlier when I raced my last Ironman. Lynne helped me realize what I already knew – I was going to have to change my eating habits if I was going to take off some of the weight I had put on. Lynne wanted me to start recording everything I ate during the day. At first I thought there was no way I was going to be able to pull it off – I am not the type of person who is super organized and it would be a big challenge for me to commit to doing something like that. But I took Lynne’s advice and decided I was ”all in” and started recording everything I ate. I used to just devour whatever I wanted without much regard to fat, carbs, and protein and never gave any thought to portion size – I literally just ate as much as I wanted. When I began recording all of my food intake, it made me think about what I was eating and why I was eating it. I had a daily calorie goal and I viewed it as a competition to try to not to go over that number. The aches and pains that I had accepted as normal suddenly began to disappear as I cleaned up the foods I ate. My energy levels picked up throughout the day – I no longer had times of the day where I felt sluggish and wanted to just lay down and take a nap. Portion size became really important to me – I was really surprised at how small most suggested portions are. I still had times during the day where I felt hungry, but instead of eating junk food and empty calories, I learned to choose to eat something that would satisfy me and not make me feel awful afterwards. Four weeks after my first consultation with Lynne, we met again for the dreaded weigh-in. I was down over 5 pounds from our first visit! It was a big win for me to see that progress. My goal is to lose the 20 pounds I gained and I feel pretty confident that I will make that happen. I have seen the importance of giving consideration to the food I put in my body and the effect it has on how I feel. I am excited to continue working with Lynne. The biggest benefit of working with a registered dietitian is that I feel accountable to her. I think it is always easier to accomplish goals when someone else is involved and has an interest in you reaching those goals. I experienced that with my years of training and racing with my friends in my running/triathlon group. If you can identify with anything that I touched on in this article I would encourage you to seek out the help of a registered dietitian. I never knew my health insurance covered their services, so that was a nice surprise. Below are the names and contact information of 2 registered dietitians that 3DPT knows and trusts (including the one I am using) and would encourage you to reach out and begin the process of learning how you can achieve better health!